After attending the G20 meeting in Australia and visiting New Zealand, China’s President, His Excellency Xi Jinping, visited Nadi, Fiji from 21-23 November to meet with the eight leaders of the Pacific island countries that have diplomatic ties with China (Fiji, FSM, Samoa, PNG, Vanuatu, Cook Islands, Tonga, Niue). President Xi’s visit to Nadi is historic and indicates China’s increasing support and strong friendship with these eight Pacific island countries. 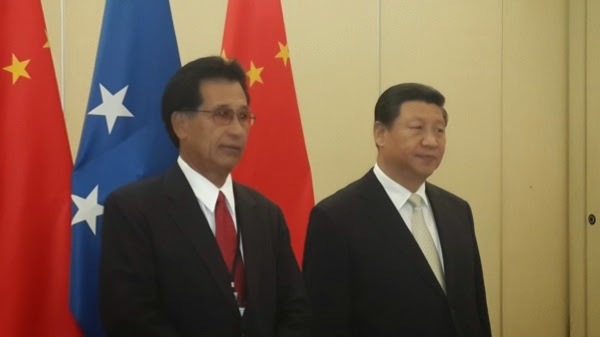 The visit was the first time for China at the Presidential level and was also the first meeting between President Xi and Pacific island leaders since taking up the Presidency in March 2013. His Excellency President Emanuel Manny Mori lead FSM’s delegation to Nadi where the two leaders met for the first time on November 22, 2014, for a bilateral meeting at the Frangipani Room of the Sheraton Hotel. During the bilateral talks, the two Presidents exchanged their courtesies and pleasantries. President Mori congratulated the two sides for the milestone achievement this year marking the 25th anniversary of the establishment of diplomatic relationship between FSM and China. President Mori took the opportunity to also reiterate FSM’s unequivocal support and adherence to the One China policy. Thanking President Xi for all the support China has contributed over the years to FSM’s nation building efforts, President Mori sought President Xi’s assistance in encouraging Chinese businesses to invest in the FSM in the areas of tourism, fisheries, agriculture, energy, transportation, and telecommunications. Noting the importance of balancing development and climate change, President Mori welcomed China and USA’s recent agreement at the margins of the APEC meeting in Beijing to work toward reducing greenhouse gas emissions. FSM and China have shared a fruitful relationship these past twenty-five years. President Mori noted the strong bilateral ties and encouraged President Xi for more people-to-people and cultural exchanges to further deepen the strong bond of friendship between the two peoples and governments. The bilateral meeting concluded with President Mori and President Xi witnessing the exchange of the agreements and MOU between the two sides. Both sides had earlier signed an Air Worthiness agreement, an MOU for the construction of the Chuuk Administration building, and an economic and technical cooperation agreement for the value of ten million USD for projects to be agreed to later by the two sides. The two Presidents also witnessed the exchange of an agreement between FSM Telecom and ZTE for cooperation in the improvement of telecommunications in the FSM. After completion of the bilateral meeting, President Mori joined his colleagues from the Pacific in a multilateral meeting with President Xi Jinping. In the multilateral meeting, President Xi announced China’s policy for Strategic Partnership for the Asia Pacific region. He informed the Pacific Island leaders that China will add $2 billion dollars more to the current $2 billion for soft loans to assist in the improvement of infrastructure facilities and promote economic development in the eight Pacific island countries. In addition, China will increase its assistance in health, education, and technical trainings for the next four years. Members of President Mori’s delegation to Nadi included, First Lady Mrs. Emma Nelson Mori, Secretary Lorin S. Robert, Ambassador Akillino H. Susaia, Ambassador Gerson Jackson, Director Andrew Yatilman, Mayor Sefet Salle, Mr. John Sigrah, and Mr. Brian P. Etscheit. 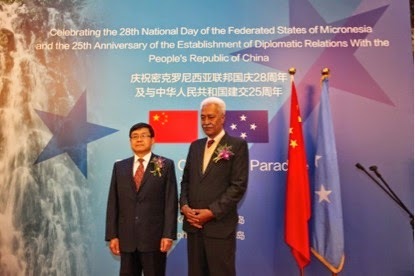 November 14, 2014 (FSM Embassy, Beijing) In honor of the 28th National Day of the Federated States of Micronesia and the 25th Anniversary of her diplomatic ties with the People’s Republic of China, His Excellency Ambassador Akillino H. Susaia hosted a reception at the Noble Club garden in Beijing to commemorate the two occasions. Ambassador Susaia delivered the welcoming statement for the event expressing gratitude to the honored guests, friends, businesses who were present. Over two hundred guests comprising of Chinese government officials, the diplomatic corps, potential investors, friends, and FSM citizens honored the celebration with their presence. The Honorable Marion Henry, Secretary of the Department of Resources and Development, and China’s Special Envoy to the Pacific, His Excellency Du Qiwen were the chief guests representing the respective governments. The official program began with the playing of the National Anthems participated by Secretary Henry and Special Envoy Du, followed by welcoming remarks by Ambassador Susaia. A congratulatory letter for the 25th Anniversary of diplomatic ties from China’s Foreign Minister, His Excellency Wang Yi, was read aloud before Secretary Henry delivered the keynote speech. In the keynote speech, Secretary Henry noted the great achievements of the four island groups uniting into one larger federation through a peaceful and democratic process. In honor of the 28th National Day, Secretary Henry paid tribute to the past and current leaders the FSM, and also expressed FSM’s profound appreciation to all her development partners. Fittingly, to honor the 25th anniversary of the establishment of the diplomatic relations between FSM and China, Secretary Henry took the opportunity to showcase and acknowledge China’s support towards the FSM’s development efforts since September 11, 1989. Secretary Henry acknowledged the fruitful relationship between FSM and China, and congratulated the leadership from both sides for their efforts and cooperation. The celebration was capped off with a cake cutting ceremony between Secretary Henry and Special Envoy Du accompanied by fireworks display in the garden. FSM students in Beijing provided cultural performance and live music entertainment. President Emanuel Mori visited Japan on November 3rd to 9th 2014 to attend the 28th Anniversary of the FSM Independence Celebration and to receive a Honorary Doctorate Degree from Sophia University, a catholic university in Tokyo run by the Jesuits. The President’s schedule in Tokyo also included an audience with His Majesty, the Emperor, and a working dinner with Prime Minister Shinzo Abe. The President also had lunch with the Chairman of Soft Bank, a company currently have investments in the FSM. Chairman Pete Christian of the FSM Congress ad some of President’s staff joined the President during his working dinner with Prime Minister Abe. The President also visited Nagoya, Kochi and Fukuoka to meet with the local government leaders, business community and members of their respective chambers of commerce, as well as welcoming the new FSM honorary consul general in Fukuoka, Mr. Wataru Aso. Also in Tokyo, the first segment of the tour, President Mori participated in various events and meetings such as the FSM Captive Insurances Council and Micronesia Registrar Advisory (MRA) seminars. He also had the opportunity to meet with FSM long-time friends and traditional supporters who have contributed to FSM’s nation-building as well as the strengthening of the KIZUNA between the peoples of both countries. President`s visit to Nagoya, the 2nd segment of the tour, was to take part in the launching of a new economic and business interactions with the Chubu region, through a seminar co-organized by the Department of Resources and Development of the FSM National Government and Nagoya Chamber of Commerce. The seminar objective was to promote and attract possible business investments as part of the Administration`s objectives to promote and strengthen the economic cooperation and business opportunities with this region. The Kochi visit, the 3rd segment of the tour, was primarily for the President to reciprocate last year’s visit by Kochi prefecture leadership to the FSM, to renew and strengthen the KIZUNA between FSM and Kochi developed through historic links. The relationship with Kochi is through the Mori families both in Kochi and Chuuk. In Kochi, a planting ceremony of a friendship tree (breadfruit tree) donated to Kochi Prefecture from FSM was held with the presence of Kochi Prefecture Governor and the President, highlighting relationship that FSM has with the prefecture. Given his personal attachment to Kochi, the President took the opportunity to interact with the people of Kochi including representatives of the prefecture and city governments, business individuals, and family members through a reception co-hosted by Kochi Micronesia Friendship Exchange Association and the FSM Embassy in commemoration of the 28th FSM Independence Anniversary. The visit to Fukuoka, the last segment of the tour, was for the President to officially welcome the new FSM Honorary Consul General in Kyushu-Okinawa region with resident in Fukuoka. During an evening reception for the occasion attended by many prominent members of the Fukuoka business community, the President thanked the leadership and the business community of Fukuoka for their support and invited them to visit the FSM to explore private sector development opportunities. President was accompanied by the Secretaries of Foreign Affairs; Justice; Education; The Chief of Staff; and support staff from Resources and Development, FSM Insurance Council, FSM Registrar Office, PIO, and some family members. FSM Congress was represented by Senator Peter Christian, Chairman of the Committee on TC&I. President Mori on his way to the Imperial Palace. He was chaufered to the place in His Majesty's limo from The New Ohtani Hotel. After holding meetings in Guam from October 31st to November 2nd, Federated States of Micronesia President Manny Mori embarked to Tokyo, Japan on November 3rd. 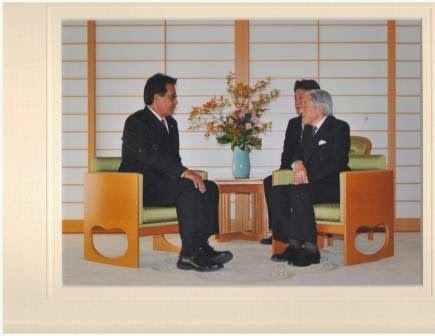 President Mori's first activity in Tokyo was having an audience with His Majesty, The Emperor of Japan, on November 4th. The President had the honor of making a courtesy visit with His Majesty as he commenced the last six months of his administration. According to President Mori, the Emperor shared interest and concerns on issues of importance to the FSM, including the environment and climate change challenges. His Majesty also recalled meeting former President Tosiwo Nakayama in the 80's before he became the Emperor. President Mori and the Emperor affirmed their mutual desire to strengthen the "kizuna" (strong bond) that exists between the FSM and Japan. After his visit at the Imperial Palace, President Mori attended the opening of a seminar dealing with captive insurance at the Aoyama Diamond Hall in Tokyo, sponsored by the FSM Captive Insurance Council. Also attending the seminar were Senator Peter Christian, representing the FSM Congress; Secretary of Foreign Affairs, Mr. Lorin Robert; Secretary of Justice, Madame April Dawn Skilling; Secretary of Education, Dr. Rufino Mauricio; Chief of Staff, Mr. Leo Falcam Jr.; and FSM Ambassador to Japan, Mr. John Fritz. President Mori expressed appreciation to the Japanese entrepreneurs who attended the seminar and invited them to consider investing and establishing business relations in the FSM. The President said although this would be his last participation at these seminar, he believed the FSM will remain committed to safeguarding stability and growth to become a leading investment domicile in the region. As the President, he has prioritized attending these seminars the past years to further strengthen FSM-Japanese relations and raise business investment confidence in the FSM. MRA staff at entrance of seminar hall taking care of logistics and providing support. A combined number of over one hundred-twenty business folks took the time to take advantage of the event. President Mori had a loaded evening schedule on this day with the FSM Independence Anniversary reception and his visit to the Japanese Prime Minister taking place back to back. Conferring of Honorary Doctorate degree to FSM President Manny Mori by Sophia University. A Honorary Degree award ceremony took place yesterday at the Sophia University campus in Tokyo on November 5, 2014. The Jesuit university officially undertook its decision to confer the honorary degree to FSM President Mori in honor of his contribution to growth and "outstanding service" in "improving lives", the President of the university said in his brief remark during the ceremony. President Mori expressed appreciation to the institution for its decision and took the opportunity through the ceremony to highlight some high-points in the history of interactive relationships between FSM and Japan. He also recognized Sophia University as an institution of higher learning enjoying regional prestige due to high achievements. POHNPEI, 3 November 2013 – The National Government of Micronesia and the United Nations Children’s Fund (UNICEF) today launched two new publications of importance for children. The first report, titled ‘Children in the Federated States of Micronesia: An Atlas of Social Indicators’, presents a comprehensive picture of the situation of children in the country. It contains a wealth of data on indicators of child well-being across different sectors including demography, poverty and inequality, education, health and nutrition, water and sanitation, disability, and child protection. The report is the culmination of an intense effort to bring together the latest evidence and analysis related to children from the population census, national household surveys, databases from different ministries, and other research conducted over the past years. The statistics and data in the report are more than just numbers – they represent the reality of life for children and their families, showing us both the wellbeing of children, but also where there challenges to their rights and wellbeing. Good quality and timely data helps governments to identify what the issues are, who the vulnerable populations are and how best to allocate resources. It helps civil society to understand the dimensions of the issues it faces and how best to plan to address these issues. And it helps organizations such as UNICEF and other international partners to identify where to target our support. In fact, a reading of the report reveals that the country is slipping back in a number of areas. Immunisation coverage, for example, varies widely between States and has decreased since the mid 2000s, according to official estimates. The measles outbreak this year is a terrible manifestation of that. Micronutrient malnutrition is relatively common: around one third of pregnant women and infants screened in public hospitals were found to be anaemic, meaning, insufficient iron in their blood. Progress towards universal primary education appears to have stalled, while secondary school participation declined over the last decade. Off course, having access to such facts and figures as included in the children’s atlas is only the beginning. Data alone do not change the world. The goal is to use the data to inform decisions, policies and targeting of resources so that we make a measurable, positive difference impact on the lives of children. That is why, in addition to the launch event this morning, this week there will also be a training on child indicators, to look at all the tables, graphs and maps in the children’s atlas, and to discuss how the information in the report could be used for effective planning, programming and monitoring. The second report being launched is the Child Protection Baseline Research for the Federated States of Micronesia. This report was initiated in 2010/2011 and has taken considerable commitment and determination from all partners. While the Children’s Atlas of Social Indicators presents an overarching overview of the situation of children in the country, the Child Protection Baseline is a “deep dive” into qualitative and quantitative factors such as violence and verbal aggression as well as policies, legislation and systems for protection of children. Providing an environment that promotes and fosters a comprehensive and accessible child protection system is challenging, made more so in the Pacific Island context where delivering services over a geographically wide area is costly and difficult. The Child Protection Baseline report also provides analysis of legal frameworks, formal social service structures, and the various environments provided by communities and families; and reviews how effectively each promotes the protection of children. The report documents that in Micronesia traditional practices at the community level go a long way in protecting children from harm, but that with increased urbanization and other changes in lifestyle, these systems are breaking down. Particular issues raised in the report include the need to strengthen the juvenile justice system so as to promote diversion and restorative justice; the urgent need to break the silence on abuse and ensure children and parents are able to speak out and seek help; strengthening both prevention and response to child abuse, and coordinating between state and national levels. Similar baseline reports on child protection have been produced in five countries Pacific countries, and most recently in the Marshall Islands and Palau. These countries have used the key findings and recommendations of their reports to plan and take action to strengthen prevention and response to abuse and violence. Also, the baselines are being used to measure their progress against goals they have set. We hope the baseline in the Federated States of Micronesia will serve a similar purpose for agreeing on goals and then monitoring progress.